I really blame North Concord/Martinez for starting the mess with the slashes in long names. 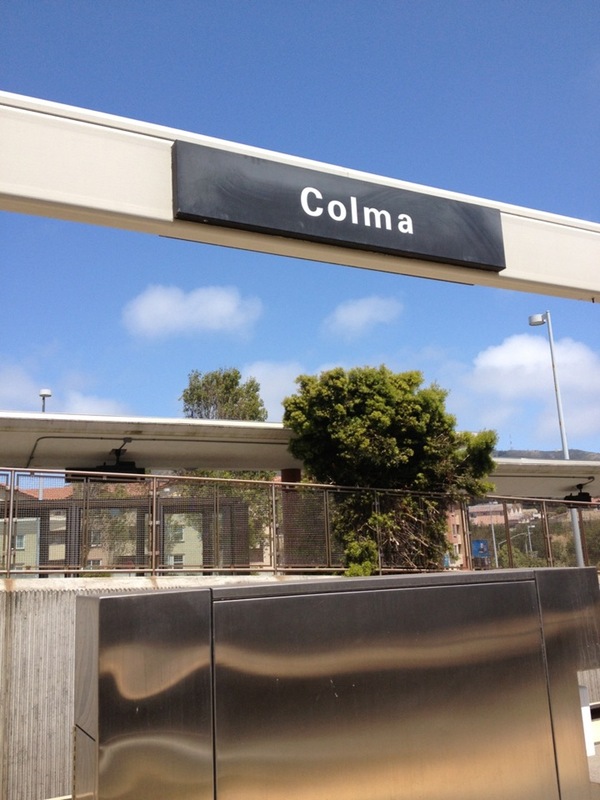 It was the first station with a slash, well before Civic Center/UN Plaza, and Pittsburg/Bay Point. I give some sympathy to Dublin/Pleasanton as the station lies on the border between the two incorporated cities of Dublin and Pleasanton. 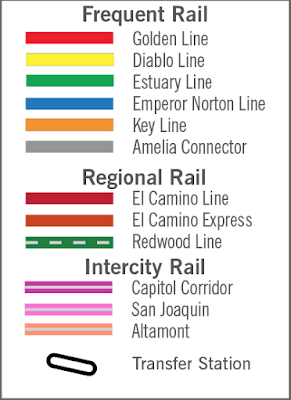 I now give you a system map of Bay Area station names... ALL WITH ONE WORD NAMES! One exception is given to numbered streets. I couldn't fathom naming a station "16th" instead of "16th Street". Somehow calling Redwood City's station "Redwood" seemed ok to me, but not "16th" in lieu of "16th St". What I'm more excited about than the one word station names is the rail line names. Although line names based on color and numbers are practical, they aren't very inspiring. It's the London Underground and its Canadian counterparts that have named lines with colorful names. The line names can be simple and practical (e.g. Central Line), honor an event or royal (Expo Line, Victoria Line). 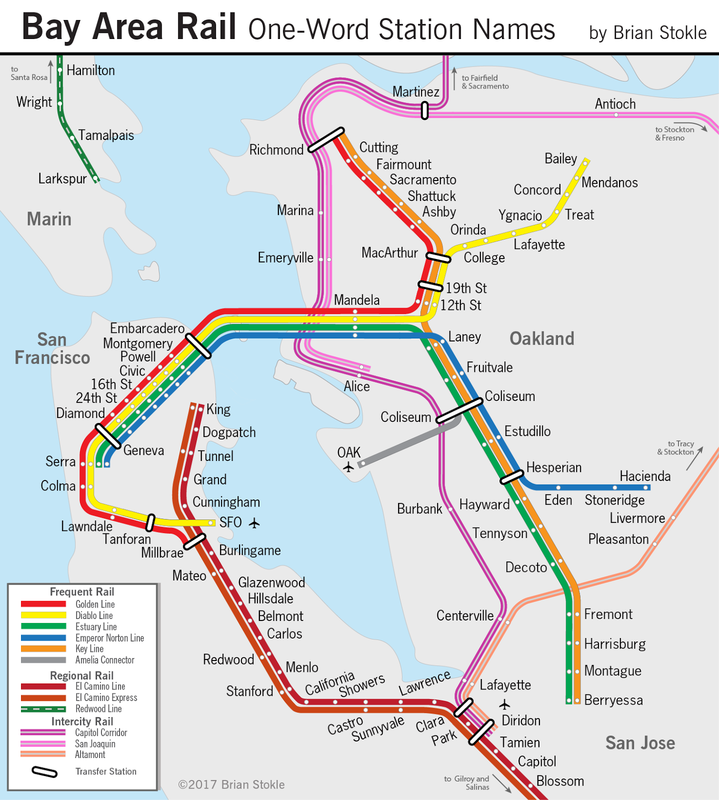 So let's give some names to Bay Area rail lines. I've come up with a few names that seem relevant geographically, historically, or just fun. Here's what I put together, but there's much room for improvement. Let me know what you think and offer your own suggestions. I look forward to hearing some great ideas in comments and on Twitter. I get most of them, but why "Golden"? Golden as in "Golden State". My other thought was the "California Line". I was trying to find a name that was either San Francisco or Inner East Bay focused, or better yet - worked for both. Thus "Golden" as in "Golden Gate" (SF), "Golden Bears" (UC Berkeley), and "Golden State" (California). I'm totally open to other ideas. Oh. I just think if you're going to have a "Golden Line" it shouldn't be the red one. Which line would you suggest for the Red Line, and which line would you think a "Golden Line" would work best for? You could just change the red color to gold and the yellow to red. The idea is that most ara general geographical features that are prominent when riding on each line. Red was hardest but I thought it goes along the Ohlone Greenway for part of it. Good ideas Aaron. 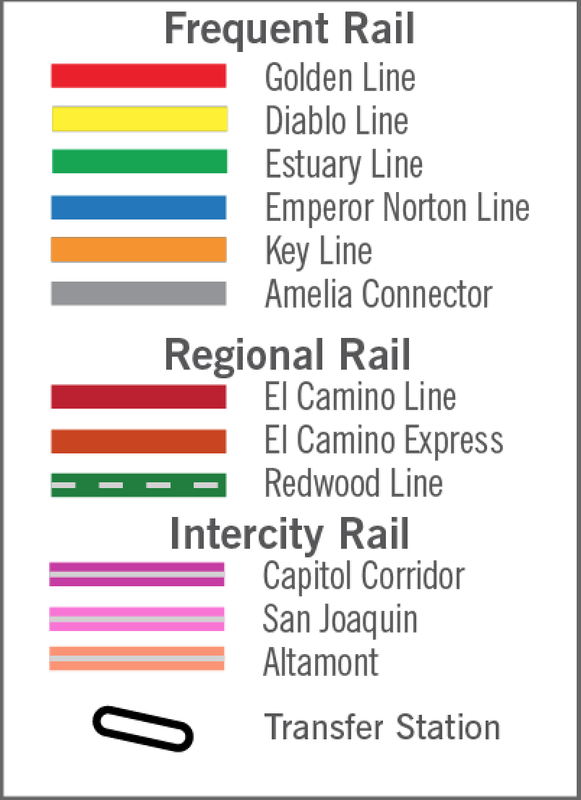 I like the Canyon Line idea, although I'm not sure if folks refer to the Dublin Grade / I-580 as the Canyon. I don't know since I only drive it once every few months, and very rarely take BART there. Foothill line works well too. I did want one line to be named with a San Francisco influenced name thus the "Golden Line" which is pretty universal (Golden Gate, Golden Bears, Golden State), and the "Emperor Norton Line". I couldn't think of any other San Francisco focused name. Of course I'm open to a Bay Area focused name. That's how the Estuary Line came about. I get geeking out on beloved topic, and certainly the names could use a simplification, but this seems a bridge too far. Why the fixation brevity, if the end product is less clear? With such a sprawling network, it's much more useful to use 'big' names like cities & well-known neighborhoods than to use street names that may only be known locally. (Also 'Rockridge' is already one word, and a constrained area at that - so why change it to 'College' when that street is over 2 miles long? I like the idea, just not the approach. Let's fix the ones that are clearly out of hand, but if it ain't broke, don't fix it. Design choices should be made with visitors in mind so that stops are intuitive for people only passingly familiar with an area. Hence, street names should be avoided as station names unless they're landmark streets. I prefer neighborhood/landmark names, 1-2 words in length (with 3 acceptable in some cases). For instance, 12th St & 19th St should be renamed to the more descriptive Oakland City Center & Uptown. (Macarthur is pretty well entrenched, but could similarly be named Temescal.) Rockridge is great. Maybe Berkeley City Center or just University for Downtown Berkeley. I'm a bit stumped on Lake Merritt. Chinatown is too generic. Lake Merritt is actually somewhat far. Laney only refers to what's currently there, and that could change. Perhaps Peralta, Merritt, or Brooklyn for the history of the area? (Though these names would more accurately describe an infill station between this and Fruitvale.) Fruitvale, Coliseum are great & descriptive. I'd love to see any name with a '/' shortened. Get rid of UN Plaza, just make it Civic Center. Would love new names for Powell & Montgomery (some reference to museums? ), and 16th & 24th. 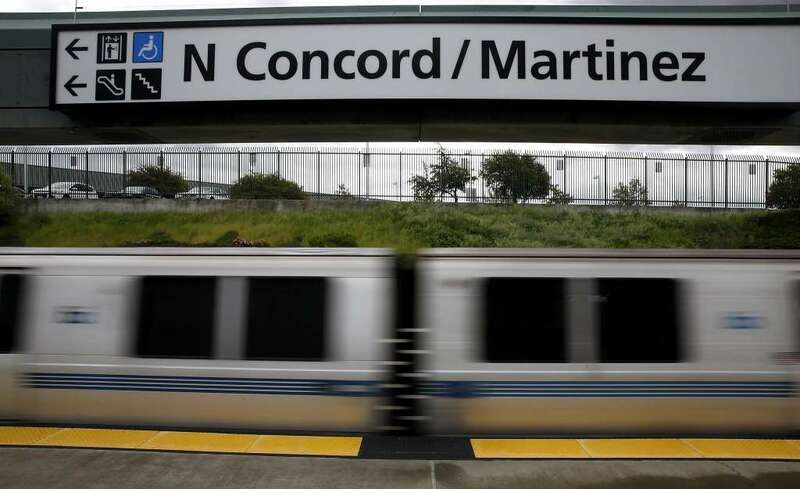 You should cut it some slack if the city name is two words such as any of the "San" cities, El Cerrito Castro Valley, Walnut Creek, Union City, etc. Just avoid the slash names except for Dublin/Pleasanton as it's the only legit use of a slash.